Professor Tong Sun and railway electrification specialists, Brecknell Willis, are jointly contending for an award in the “Outstanding Contribution to Innovation and Technology” category. 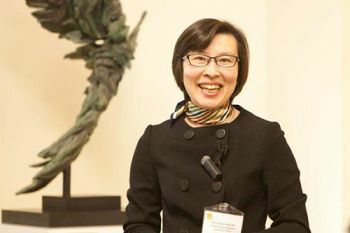 City’s Professor of Sensor Engineering, Professor Tong Sun, together with her colleagues in the Optical Sensors Research Group and railway electrification specialists, Brecknell Willis, are jointly contending for a prestigious 2015 Times Higher Education Award for “Outstanding Contribution to Innovation and Technology”. Through the collaboration of Professor Sun with Brecknell Willis, City has pioneered an innovative technological breakthrough by successfully instrumenting a railway current-collecting pantograph, using an optical fibre sensor system for real-time monitoring of its contact condition with the overhead line electrification (OLE) system. 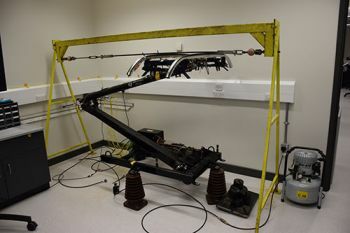 Pantographs operate in harsh environments (extreme heat and cold climatic temperature, for example) as their carbon strips rub along the OLE at up to 25k volts, with speeds of around 125 mph. The City-Brecknell Willis instrumented pantograph monitors the pantograph’s condition in real time. The global annual demand for new pantographs is estimated to be approximately 5k in Europe, 8-10k in Asia and the Middle East and 5-8k in North and South America. Professor Sun says the impact of this technology could be significant: “The implementation of the instrumented pantograph across the UK rail network could result in the provision of faster, greener, quieter and more reliable services and could give the UK rail industry a competitive advantage over its overseas counterparts.” Alongside City, Cardiff University, Cardiff Metropolitan University, University of Glasgow and Queen Mary University of London have also been shortlisted under the “Outstanding Contribution to Innovation and Technology” category. The winner of the award will be announced during a dinner and ceremony taking place on 26th November at the Grosvenor House Hotel, Park Lane, London. A pantograph is a folding traction current collection device mounted on the roof of a train, tram or electric bus which collects electricity from an overhead catenary wire.